Reply, 'Miss of Orkney to Mr A. Liddel at Thurso'. Summary Reply, 'Miss of Orkney to Mr A. Liddel at Thurso'. 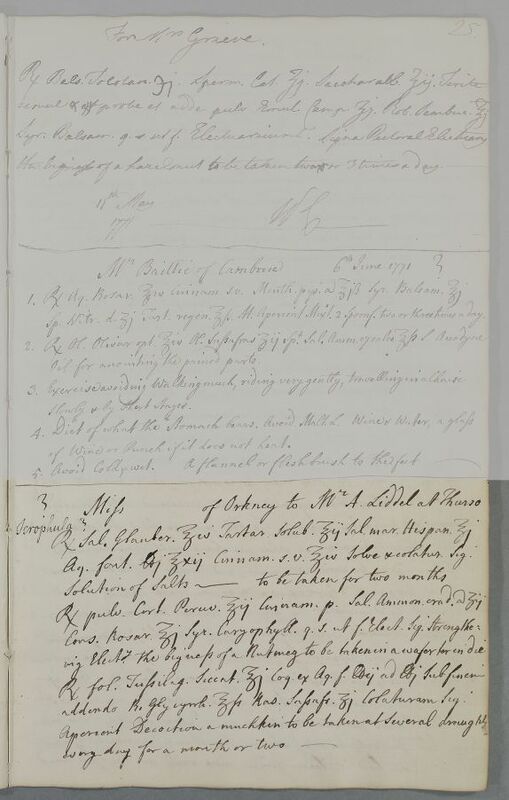 Case of Miss---- of Orkney' who is prescribed salts, an electuary and and aperient. She may be the same patient as in Case 339. Take 4 ounces Glauber's salts, 2 ounces Soluble Tartar, 1 ounce Spanish sea Salt 1 pound 12 ounces of spring water, and 4 ounces of Cinnamon spirit. Dissolve and strain. Label: Solution of Salts -- to be taken for two months. 2 ounces powdered Peruvian Bark, 2 drachms each of Cinnamon powder, Crude Ammonium Salts, 1 ounce of Conserve of Roses, and a sufficient quantity of clove syrup to make an Electuary. Label: Strengthening Electuary, the bigness of a Nutmeg to be taken in a wafer 3 times a day. Aq. font. lbj ℥xij Cinnam. s.v. ℥iv Solve & colatur Sig. addendo R. Glycyrrh ℥ſs Ras. Sassafr. ʒj Colaturam Sig.